Watermelon Gazpacho Soup is packed with fresh watermelon, cucumber and Southwest spices(add a jalapeño if you dare)then topped with tangy feta cheese crumbles for a refreshing spin on an the classic watermelon feta salad. This easy, healthy soup will become one of your favorite Summer Recipes. If you are looking for a cool and refreshing way to serve watermelon without the sticky mess, this is the recipe you are looking for! It’s a great recipe to make in advance and keep chilled until the par-tay starts. 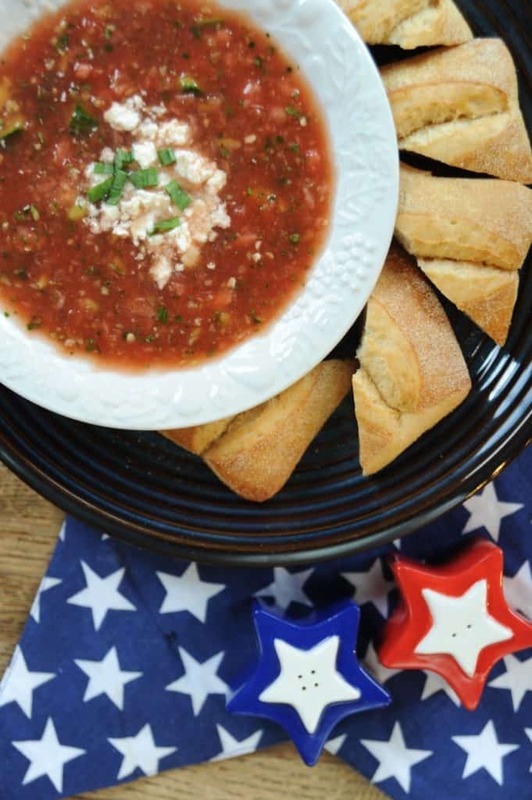 Watermelon Gazpacho Soup is a fun and refreshing dish for a summer picnic or pool party. You can dress it up in shot glasses for a classy appetizer for an evening cocktail party. Did I mention that it Watermelon Gazpacho Soup is healthy and low calorie? Keto friendly and vegetarian? 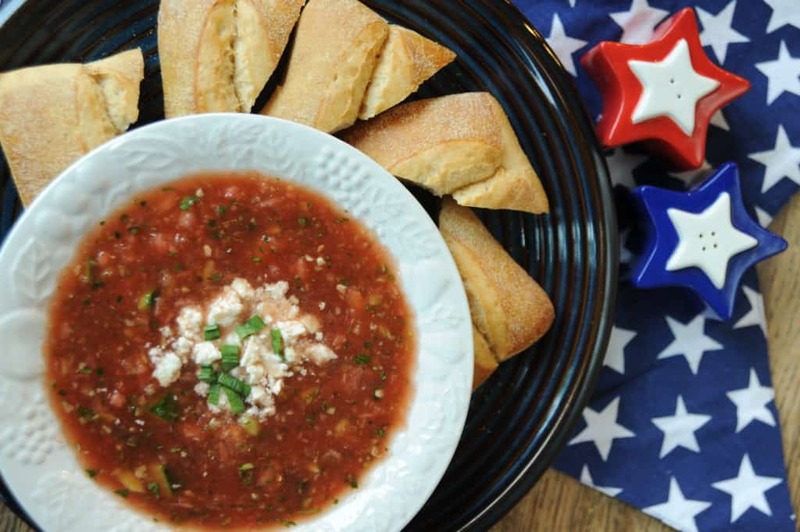 This recipe was originally posted by my sister, Donna Kelly on the 4th of July way back in 2011. It has been a reader favorite ever since. 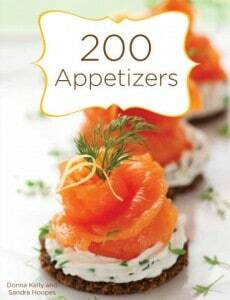 Donna is known for her fun and imaginative holiday recipes like this one. I have updated her post to our include our new printable recipe plugin so that the recipe is easier for you to print out and save to your own recipe collection. Yes, I missed her gazpacho-eating days. Anne, my daughter, co-blogger and culinary muse, grew up in Colorado with a mom who made gazpacho (described here recently) and she downed it by the gallon. I missed those years after she was placed for adoption. Turns out that I, too, was still a kid and had some growing up to do before I was capable of being the mom she deserved. Since we reunited in 1999, Anne very graciously welcomed me into her life and we began cooking our way along, making up for lost time all the while chopping, stirring, braising. More importantly for purposes of this blog, we are both adventurous in the kitchen and love taking ordinary foods and tweaking them, making a whole new creation we never thought possible. Kind of like us. So here, as a tribute to you Anne, is a fresh take on gazpacho made with the winning flavor combo of watermelon and feta. If you would have been in my kitchen with me today, I am certain we would have made this exact dish together. Tasting and laughing as we went. I had leftover watermelon and thought of making a watermelon feta salad, which I have eaten many times in restaurants. But then I thought of Anne’s recent gazpacho post, and decided to throw caution to the wind and whirl a batch of gazpacho in my food processor. This will surprise you – I mean, how could something that looks like salsa in a bowl taste sweet and summery and refreshing? Well, it just does. I have updated her posts to our include our new printable recipe plugin so that the recipe is easier for you to print out and save to your own recipe collection. Keywords have been included to make the recipes easier to find. Place half of watermelon, cucumber, and all of the onion, cilantro and zest and juice of the lime in food processor and process until very smooth. Pour into serving bowl. Place remaining ingredients into food processor and pulse until very small pieces. Add to serving bowl. Stir in half of the feta. At this point, taste and add salt, pepper or sugar as desired. To serve, ladle into serving bowl and then sprinkle with remaining feta as a garnish. Wow! A soup for all seasons: ve, low calorie, easy, pretty. It has it all. So many amazing flavors! I love the addition of feta! What a refreshing recipe! This is absolutely perfect for summer!